Two 7th-grade students, Emma and Jackson, began their latest math homework. They dreaded it: a set of word problems. You know, that kind of question. In the past, Emma and Jackson would have seen the same questions and received the same nominal feedback - correct/incorrect, maybe an explanation of how to solve the problem. But lucky for them, the system they’re now using employs adaptive learning technology. Over time, the adaptive learning system has come to know Emma’s and Jackson’s strengths and gaps, and it is now able to provide real-time personalized recommendations. For example, the system knows Emma understands the math, but struggles with reading. The system also knows Jackson’s challenges are different, and provides feedback tailored to him. A nice story, yes? Can it really work? Yes! There’s a lot of interest today in utilizing technology in the service of education. While many resources are related to infrastructure—internet connectivity, learning and student management systems—significant focus is being placed on “adaptive” or “personalized” learning. Adaptive learning is a way of using technology to leverage what we know about the student—across multiple dimensions—and what we know about that student’s objectives, and then using that information to identify what the student or teacher can do to help the student reach those objectives. It recognizes that the learning skills and goals of students are different. Other variables include the pace at which they process new information, the degree to which the student is prepared to learn new material, the instructional approaches that are most likely to help each student, and the motivational factors that are important to the student. Identifying and acting upon all of these differences, for even a handful of students simultaneously, is challenging for any teacher. Success depends on knowing each student well, especially since all of these factors vary from student to student, context to context, and moment to moment. What is needed as the foundation are reliable and appropriate measurement models to make appropriate and informative inferences about each student. 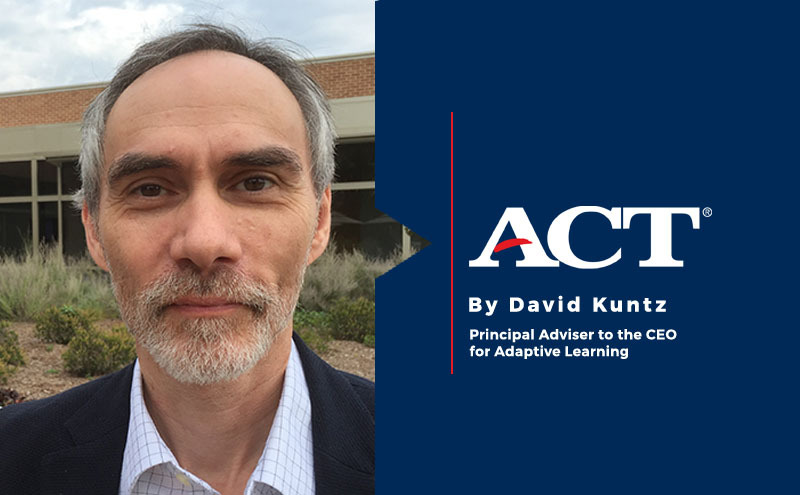 At ACT, we see adaptive learning as a way to seamlessly integrate measurement into learning so results can be immediately actionable, targeted to each student’s needs and goals. That’s a remarkable path forward. And we are already on that path as we pursue new opportunities to fulfill our mission—helping people achieve education and workplace success—through personalized and adaptive learning. Or, as Emma and Jackson might say, if you’re not sure what you’re doing, you’re probably heading for a train wreck.